ROBERT GARCIA: "NONITO HAS TWO OR THREE MORE WEIGHT DIVISIONS HE'S GOING TO DOMINATE"
"If we talk about skills, I could say maybe Nonito is the more skillful fighter than Pacquiao. Maybe Mayweather is more skillful than Pacquiao, but for what he's done, you know, coming up from flyweight and being a welterweight, super welterweight, and still winning titles and beating everybody in front of him, well, like I said, maybe we'll never see that again. But if we talk about skills, I'm not afraid to say that Nonito is more skillful and it's just a matter of time. I think Nonito has two or three more weight divisions he's going to dominate after this one. I don't know how far he could go, but I think at least two or three. I think he does have the power to be able to dominate," stated world-class trainer Robert Garcia, who talked about WBC & WBO bantamweight champion Nonito Donaire's upcoming October 22 clash with undefeated two-division world champion Omar Narvaez. Check it out! 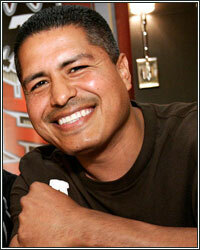 BT: Hey Robert, recently, Miguel Cotto replaced Emanuel Steward with a Cuban amateur trainer, Pedro Luis Diaz. I wanted to get your thoughts on that subject. How much do you know about him? Are you looking at that as a big advantage now going into the fight? RG: You know what? I honestly have no idea who this guy is. I never even heard about him. Hopefully he's good. I know Emanuel Steward is one of the best in the business; one of the best in the world. I was actually looking forward to being in the opposite corner of Emanuel Steward. You know, I want to test myself against the best trainers out there too so it was also a challenge for me, but I don't know who this guys is. I'm sure he's good. Cotto picked him and, you know, it must be for a reason. Hopefully it's for something good and something better than what Emanuel was going to bring to training camp, so it'll be a bigger challenge if that's the case. Hopefully that's what it is because that's what I want. BT: Obviously you've got both Margarito and Brandon Rios going on that card in December, but you've also got a couple of other fighters with some fights coming up. In fact, one of them, who's one of the top pound-for-pound fighters in the world, has a fight that's right around the corner. RG: I also got Nonito [Donaire] on the 22nd. Both him and my brother Mikey, they both fight on the same card. BT: Is it difficult for you to train two guys at the same time when they're fighting on the same card? RG: It's difficult right now because Nonito trains in Northern California; that's what makes it difficult. With Brandon and Margarito, we have them training together, so that don't make it hard at all. I'm able to pull it off, you know, training Brandon at 12:00 and Margarito at 2:00, so that gives me time for both of them. They're fighting on the same card, so we'll be traveling together; we'll be doing everything together. Right now, me having to drive to Northern California two or three times a week to come and work with Nonito and drive back home and work with my brother another three times a week, that's what makes it a little bit hard, but that's my job and I enjoy it. I come to Northern California and they treat me really nice. Nonito is really good, his wife and his team, they give me the royal treatment, so I feel very comfortable. BT: Nonito is fighting the Argentinian Omar Narvaez. Although he's an undefeated 2-division world champion, he's relatively unknown to the casual boxing fan. Has it been difficult for Nonito, or any of your fighters for that matter, to train at a high intensity if it's not a mega-fight? RG: You know what? When it comes to training, I'm blessed with my fighters training hard for every single fight and taking every fight hard. Nonito, like you said, it might not be a mega-fight, but it's still big for him because he knows what winning the fight brings for him next. There's big fights at 122 that are already being talked about, so he knows the importance of this fight. He's training hard and sparring hard every day; running and doing everything just like if it was the biggest fight of his career. And of course, we gotta talk about Margarito, definitely, this fight is so important because, you know, if he's not able to win this fight, then we gotta be thinking about maybe going towards the end of his career, so he's gotta win this fight to get to those next big fights. Same thing with Brandon, you know. We gotta beat this guy. Don't know much about his opponent yet, but we gotta take it serious. Every fight has got to be serious because all of those fights take you to the big payday, so they gotta take it serious. BT: It seems like Nonito doesn't get quite as much support from the fans as Pacquiao does. Do you think that has anything to do with his style and the fact that he's more of a technical fighter? RG: Well, it's just a matter of time. What Pacquiao has done and what he has going on right now is something that we might not see again. We might not see another fighter, Filipino or Mexican or whatever, we might never see that again from a boxer, at least not anytime soon. That's the way I feel about what Manny Pacquiao has accomplished and done. If we talk about skills, I could say maybe Nonito is the more skillful fighter than Pacquiao. Maybe Mayweather is more skillful than Pacquiao, but for what he's done, you know, coming up from flyweight and being a welterweight, super welterweight, and still winning titles and beating everybody in front of him, well, like I said, maybe we'll never see that again. But if we talk about skills, I'm not afraid to say that Nonito is more skillful and it's just a matter of time. I think Nonito has two or three more weight divisions he's going to dominate after this one. I don't know how far he could go, but I think at least two or three. I think he does have the power to be able to dominate. BT: Nonito has the ability to set traps and catch guys with counters, like he did against Darchinyan and Montiel, or he can also outbox them for 12 rounds, like he did against Concepcion. In both instances, he's putting his technical skills on display, but if he doesn't get a knockout, it's almost like the performance isn't considered quite as good. Do you think fans put too much emphasis on the result of a fight as opposed to the performance? RG: When we talk about fans, fans are those that just want to see a great fight and they feel that if somebody gets hit and comes back and knocks the guy out, that's the best thing in the world. That's what fans want. Fans don't know boxing. Fans don't study video, don't see techniques like a Nonito, like a Martinez, like a Mayweather; they want to see the wars. You know, that's fans. Fans love to see a fight happen and they want to see knockdowns. They want to see you get up and knock your opponent out. They want to see you get cut and come back and beat them up; that's what they want to see and that's why fans are big on some fighters and not on the ones that are very skill because the ones that are very skillful are the ones that hardly get hit, the ones that hit you whenever they want and hardly get hit, but that's not what fans want to see. That's not what fans like. Boxing experts, people that are in boxing, we know who the better fighters are and who the more skillfull fighters are, but fans just want to see the wars; they just want to see the fights.